All lettuces are not the same when it comes to flavor and nutritional value. Watercress and Arugula are loaded with cancer fighting compounds, while light greens, like iceberg, are not as nutritional. 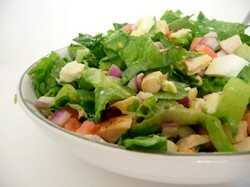 Some salads can contain over 1000 calories and 40 grams of fat. That is more calories and fat than some fast food burgers! So choose your salads wisely, and know the calorie and fat content of your salad before you eat it. While you save on calories with fat free dressing, you are not getting nutritional value with fat free dressings. Some fat free dressings take out the fat but have more sugar per serving added. In one study, full fat salad dressing absorbed twice the nutrients of those using reduced fat dressing. Fat free dressing allowed little to no absorption of the good nutrients. According to the Centers for Disease Control in Atlanta, lettuce, sprouts, and tomatoes are some the most common carriers of salmonella and other harmful microbes. To reduce this risk, wash your salad thoroughly before eating. Colorful salads are better for you. Colorful salads offer good for you phytonutrients that aren't found in green salads. Purplish vegetables, such as eggplant, help to reduce heart disease. Radishes offer cancer-fighting idoles. Red tomatoes are linked to helping lower the risk of heart disease and cancer. Butterhead - forms loose heads. Chinese lettuce - long, sword-shaped, non-head-forming leaves, with a bitter and robust flavor. Iceberg - forms tight, dense heads that resemble cabbage. Looseleaf - has tender, delicate, and mildly flavoured leaves. Romaine - grows in a long head of sturdy leaves with a firm rib down the center. Batavian - forms moderately dense heads with a crunchy texture. Between iceberg and looseleaf types. Appetizer Salads - Appetizer salads are light salads to stimulate the appetite as the first course of the meal. Main Course Salads - Main course salads usually contain a portion of protein, such as chicken breast or slices of beef. Side Salads - Side salads accompany the main cours as a side dish. Yes, petunia, salad calories can pile up fast. It's all in what you put on the salad. Thanks for stopping by. We eat salads several nights a week, especially in summer, and especially right now as we are both dieting. But oh those calories can pile up fast if I am not careful! Your information is right on target - salads are misunderstood most of the time! Interesting facts! Glad you dispelled some of the myths about eating salads. Why do some people choose a vegetarian or vegan diet? A common question with many answers but here are the four main ones!